Legacy business architecture is focused on “business at rest”. 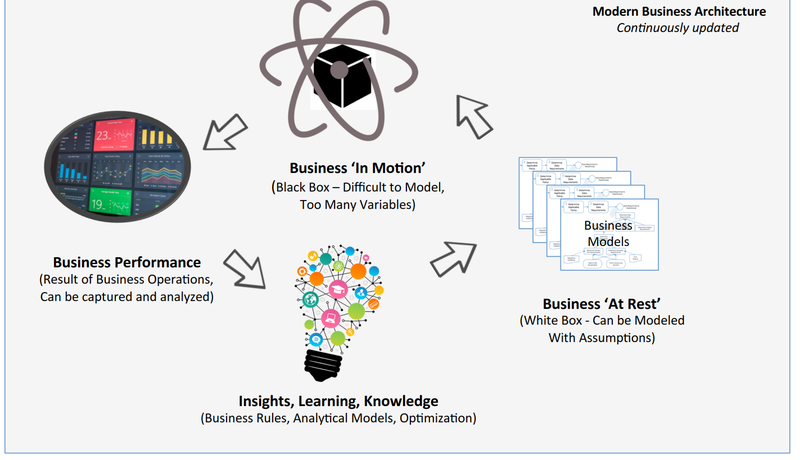 Documents are developed and published but they are not model-based, making it hard to keep a business architecture “alive” as systems are developed and evolved. Performance monitoring and learning is often dumped as deadlines loom and what is learned is often not fed back well enough. A focus on models not documents has increased agility and transparency while reducing time to value. Use of BPMN and DMN engages the business and frees technology to focus on engineering problems. Register to receive a copy of the presentation here. If you are interested in adding a decision architecture to your existing business architecture, or develop a model-based architecture, Contact Us. Next Post New Book: Real-World Decision Modeling with DMN now available!